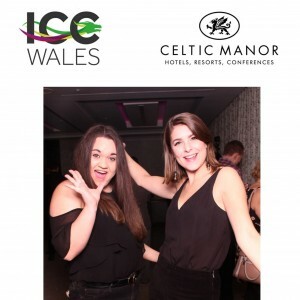 Last weekend the team headed over the Welsh border to experience the delights of Celtic Manor Resort - and what an experience it was. They loved it so much, Emma and Sarah couldn't wait to share their pictures with us all. 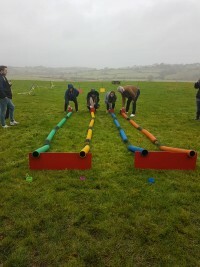 "We were really looked after from start to finish and nothing was too much trouble for the team at Celtic Manor. We arrived for coffee with pancakes and Welsh cakes just to get into the Welsh spirit then taken down to the Coldra Court for a buffet lunch with cocktails. After lunch we headed back to the resort for gun dog handling and ferret racing - not something we'd experienced before that's for sure. 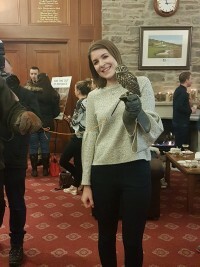 To warm up, we went back inside for a light snack (yes more food) with hot chocolate, loose tea, coffee and freshly cooked sausages where they also brought in an owl for a quick photo opportunity. 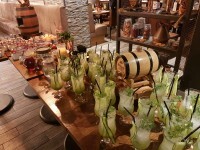 The Celtic Manor was all about the personal touches. That afternoon we headed to a Gin belnding class where we made our own blend of gin which we got to keep and they had even made us personalised aprons! We love a personal touch here at HTS! After consuming some of the gin, it was time to relax and make the most out of their amazing spa facilities. Not too much relaxing though as we headed back from for a drinks reception in the new ICC Wales (building site) where we were surprised by some outstanding opera singers. Back at the resort, we were treated to a buffet dinner with VR headset entertainment - it was hilarious. If you want to know more, just let us know. The facilities were great and as we said, The Celtic Manor is all about the personal touches and we absolutely loved our stay. Thank you so much for the fantastic hospitality." 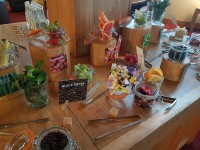 Check out our Twitter page for all the yummy food the girls got to induldge on.